5 IN 1 COMBO: BOUNCING AREA, CRAWL-THROUGH, CLIMBING OBSTACLE, EXTERIOR SLIDE AND BASKETBALL HOOP. TOTAL WEIGHT OF PASSENGERS NOT TO EXCEED 1200 LBS! NO ONE OVER 150 LBS! TELL CUSTOMER - MUST BE ON LEVEL, HARD FOUNDATION; CANNOT USE IN HIGH WINDS OR RAIN. 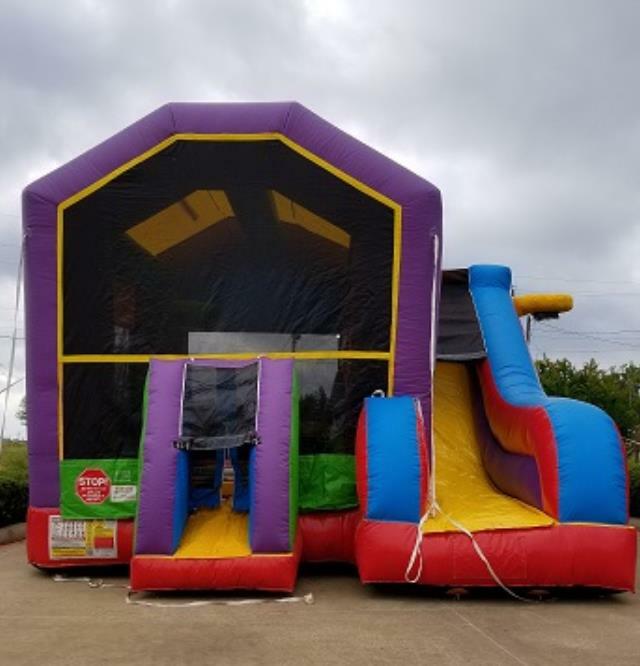 * Please call us for any questions on our bounce house wacky 5 in 1 combo rentals in White Oak, Longview, Gilmer, Gladewater, Big Sandy, Kilgore, and all of East Texas.